We partner with Trail Running Nepal and can highly recommend these excellent races in Nepal! Sign up here for the Trail Running Nepal newsletter if you’d like more trail running news from Nepal. Swayambhu and Boudhanath are the two most important and iconic Stupas in Kathmandu. You start in the early morning at Swayambhu (nicknamed the monkey temple for reasons that will become obvious) and run to Boudhanath at the other side of the city … but the long way round … via 53km of hilly trails. With one big ascent at the beginning of the race to Jamacho Gumba the rest of the race is on beautiful mostly runnable trails skirting the edge of the valley rim. At a steady walking pace it can also be completed in under 12 hours. It’s a really great day out! Register here! This is the place to be in April. No place like it! Still places for 2018, see Mustang Trail Race facebook page for photos and stories. This is eight stages of racing across the surreal landscape of an ancient seabed etched by wind and water, sandwiched between the planet’s hightest mountains and the vast Tibetan plateau. The race takes you on beautifully runnable trails through a cultural exploration of this traditional Buddhist landscape. Not like anything you will have experienced before! Click on the photo to experience Mustang in 55 seconds. It’s worth it! Info and registrations! Click on the image to watch Mustang in 55 seconds! A true classic – 50 km and 100 km options and a memorable race experience. This was Lizzy’s first race in Nepal & look what happened. You’ll be back again and again! Information here! 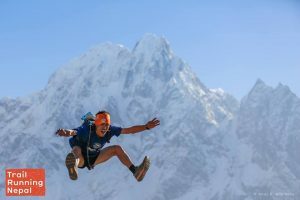 A challenging multi-stage trail race passing through some of Nepal’s most beautiful Himalayan landscapes in a part-circumnavigation of Manaslu, the world’s eighth highest mountain. Nothing much more we can say, it’s really special and you need to see it for yourself! Click the image below to watch a short 6 minute video. Information and registrations here!